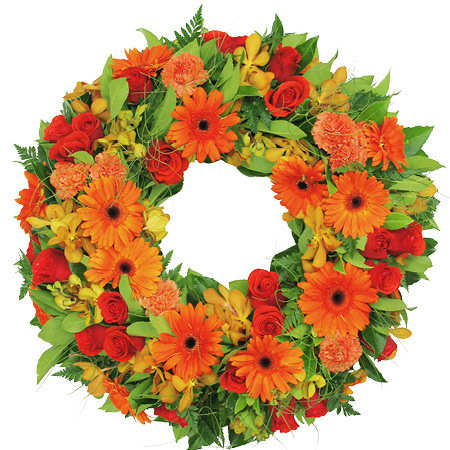 This beautifully bright and luscious floral tribute wreath is an appropriate design for delivering sympathy flowers or to organise for a funeral service. Featuring a vivid mix of fresh blooms, your wreath features deep red-orange roses, frilly apricot carnations, tropical orchids and bright orange gerbera flowers. Finally, all the colourful orange tones are wonderfully off-set with pops of greenery and dainty ferns. This designer sympathy wreath is available in two sizes (50 & 60cm diameter) and can be ordered online or by calling our helpful team on 1800 66 66 46. *Please note this wreath design is exclusive to flower delivery in the Sydney metro region. If you wish to send outside this location, please give our team a call directly on 1800 66 66 46 or email sales@flowersforeveryone.com.au to confirm availability and prices to your preferred location.